XXI Commonwealth Games Gold Coast lead contractor gives praise. Hammer Discus Cages / Testimonials / XXI Commonwealth Games Gold Coast lead contractor gives praise. The Carrara Precinct was a major event and sporting hub during the XXI Commonwealth Games Gold Coast. The Carrara Stadium hosted the opening and closing ceremonies of the XXI Commonwealth Games Gold Coast, as well as the track & field events of the Athletics sports program. The objective of the project labeled Carrara Overlay Development was to temporarily transform the existing AFL compliant Carrara Stadium and adjacent Elite Fields into an IAAF compliant athletics track and field competition and warmup facility to host events and associated test events as part of the XXI Commonwealth Games Gold Coast. Gold Coast 2018 Commonwealth Games Corporation (GOLDOC) engaged Cockram Constructions Queensland Pty Ltd (CCQ) to deliver the design and construction of the project including operational services during the event period. Cockram Constructions placed a tender for supply of IAAF compliant athletics track and field sports equipment and Play Hard Sports Equipment (PHS) was successful in supplying the two IAAF accredited Thor 10 hammer discus cages displayed in the main stadium and external warm up track. Play Hard Sports Equipment (PHS) installed all Throw cages – as per the CCQ SP2 Program. All staff were present and available for asset management at the 2018 Australian Athletics Championships 15-18 February and XXI Commonwealth Games Gold Coast competition 25 March–14 April. 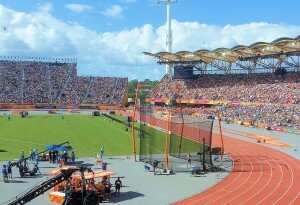 During those two major events Play Hard Sports Equipment (PHS) provided support with multiple installations and removal of the main track cage before and after the 2018 Australian Athletics Championships, the main XXI Commonwealth Games Gold Coast competition days and closing ceremony in accordance with specified transition timeframes. It was an absolute pleasure to work with Trevor Bowman, Steve Dart and the entire Play Hard Sports Equipment team who collaborated effortlessly and displayed superior responsiveness and great teamwork to deliver this project without any delays. We have really enjoyed working with such a dynamic team and look forward to more great partnerships in the coming years.